News and updates about Xoyondo. We improved our Business subscriptions. 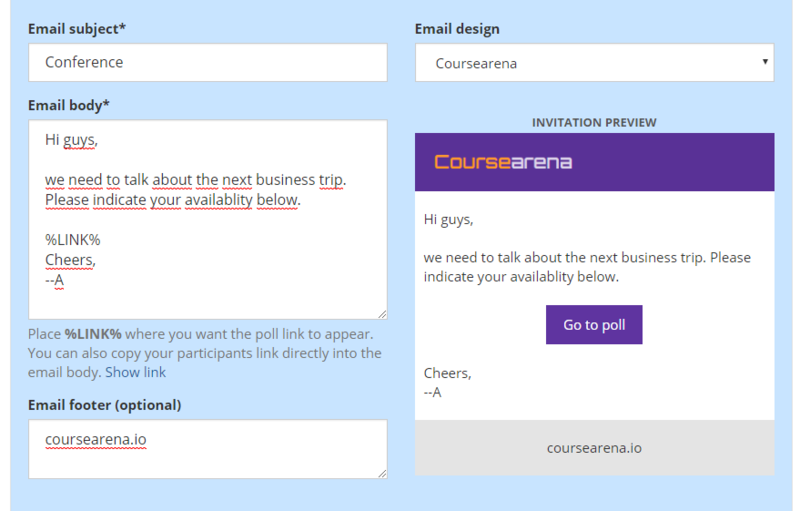 As Business user you can now send out custom email invitations to the participants in your poll or message board. You are completely free in the choice of the email subject and content. Furthermore you can adjust the design of your messages and use your own logo and color scheme. Give it a try with our 30-day trial. Please let us know what you think! PS We also improved our Premium service. Polls by premium users are now completely ad free! Do you have many or frequently changing polls? Create a personal Xoyondo page with a URL of your choice and publish your polls and message boards on this page. In this way you don’t need to send out many different poll links to your participants. Just let them know about your personal page and they will have access to all your published polls instantly. Creating your personal Xoyondo page is simple. Just sign up for a free Xoyondo account, choose your page name and publish a selection of your polls with a single click. We added a new viewing option for large meeting polls. 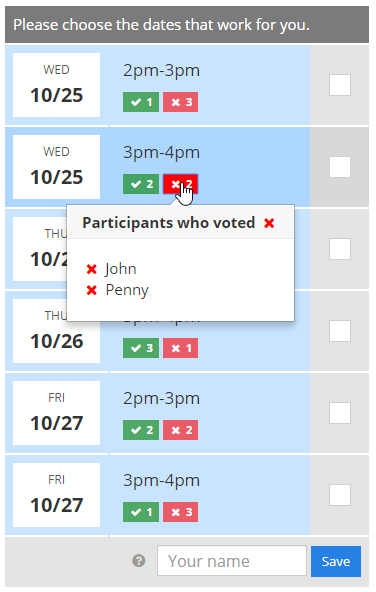 Instead of the tabular view (which is default), participants can now choose to view the poll as a list. This is useful for polls with a large number of choices or with many participants. It makes especially voting from mobile devices easier. We hope you will enjoy the new feature. Let us know what you think! 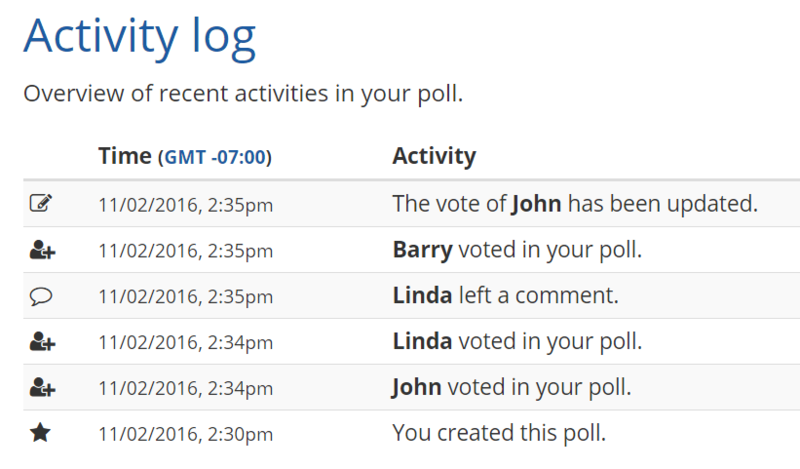 You can now reuse your existing polls more easily by duplicating your meeting polls in the admin area. Furthermore you can choose if you want to copy existing opinion polls, anonymous poll or comments that are attached to your meeting poll. 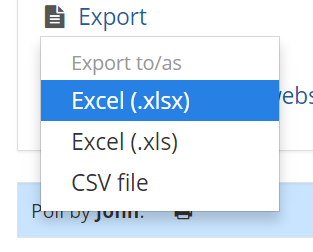 It is now possible to export your meeting and opinion polls to Excel or extract the data to a CSV file. This is especially useful if you have polls with a lot of participants and need to sort or filter specific columns to efficiently assess the results. 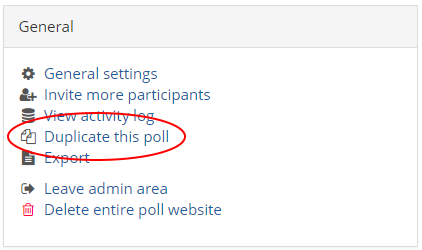 You can find this new feature in the admin area of your poll. Keep track of the activities in your poll with our new activity log. Check it out, it is accessible via the admin area of your poll. Choosing the dates and times in your polls just got a lot easier and faster. Instead of selecting possible dates with our standard calendar and entering the times for each day manually you can now specify your dates and times using a detailed calendar. 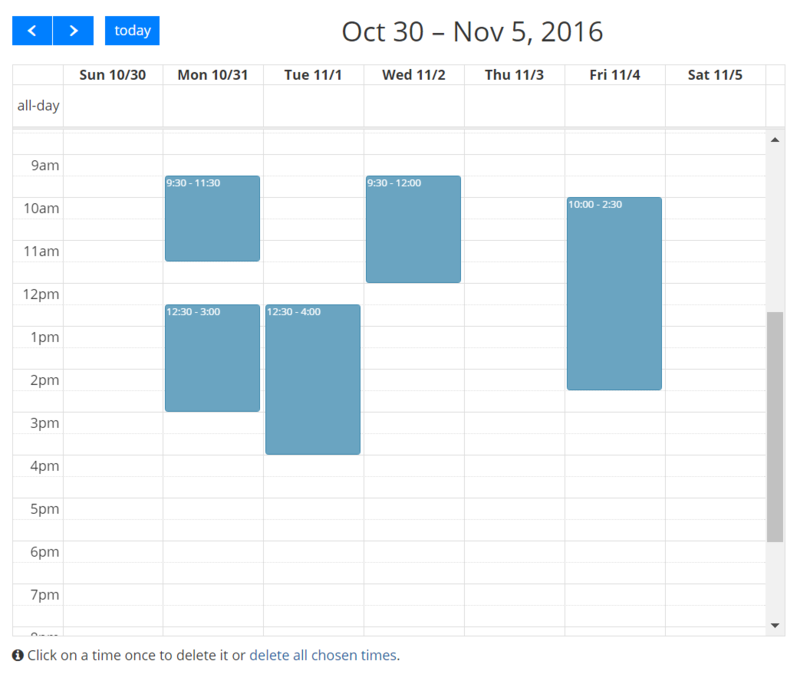 Select suitable times just by clicking, expanding and dragging within our new calendar plugin. It doesn’t get easier than that and of course it works on touchscreens too. The old way of selecting your dates and times is of course still available. This is more suitable if you don’t want only to choose times but also want to specify other information (e.g. places) that your participants can take a vote on. If you have questions or comments, let us know! Posted on 25. October 2016 25. October 2016 Categories FeaturesLeave a comment on Choose possible dates faster! It is now easier to schedule meetings where the participants are located in different time zones. When you create a poll and define possible times for your meeting you can now also specify the time zone of the location where the meeting will take place. This will allow your participants to automatically convert the suggested times to their respective time zones with a single click. This makes it easier for them to check their availability and to respond to your poll. If you have question about this new feature, please contact us on Facebook, Twitter or just leave a comment here. 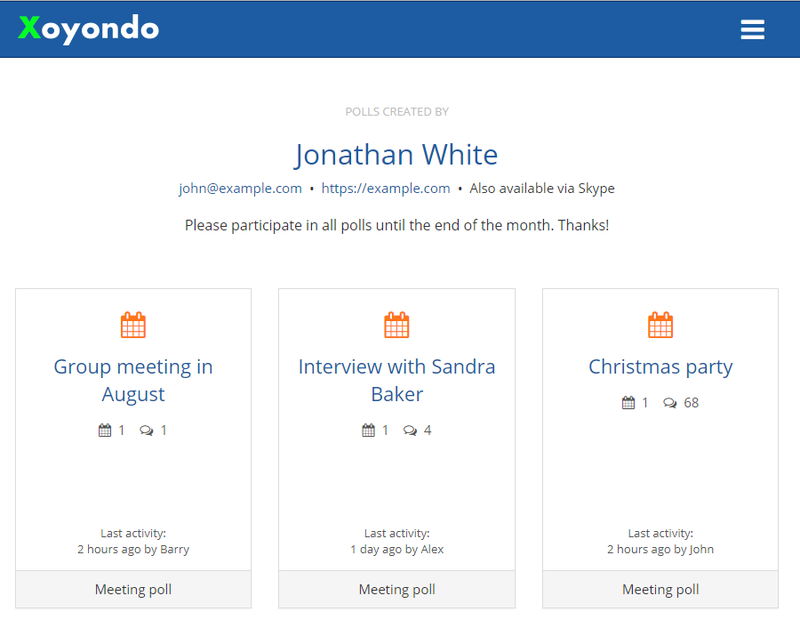 Organize your polls with a Xoyondo Dashboard. Xoyondo Dashboards are here. If you are the administrator and/or participant of multiple polls or message boards on Xoyondo the new Dashboard functionality will help you keep the overview. You can easily add all your active polls to a Dashboard which allows you to access the polls and the corresponding admin areas from a single website. Furthermore you are able to monitor properties and recent activities in your polls. In order to add a poll to your Dashboard just insert the link of the poll or the admin link if you are the administrator into the corresponding field on the Dashboard website. If you already have a Dashboard new polls can be automatically added during the setup. If you have suggestions how to further improve the new functionality we would be happy to hear about it. Please contact us by email, Facebook, Twitter or just leave a comment here. Posted on 20. February 2016 Categories FeaturesLeave a comment on Organize your polls with a Xoyondo Dashboard. we have improved the print functionality for meeting and opinion polls. You can now choose between two different views to print your poll. You can either print your poll using the usual tabular view or a condensed version which is suitable if there are many possible dates and times. 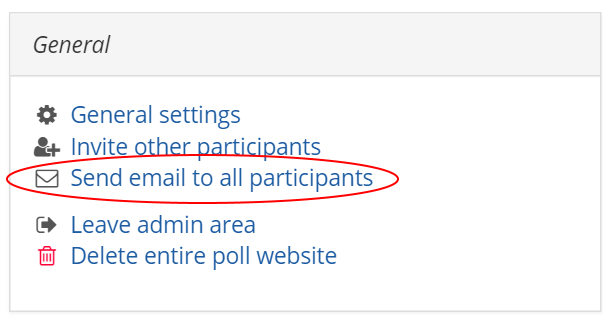 We also added a new notification feature that allows you to send an email to all the participants of your poll directly in the admin area. Please note that you can only use this feature if you invited your participants via Xoyondo. If you have suggestions how to further improve Xoyondo, please let us know.